See a PDF of the full report from St. Marys mayor Patrick McGowan. 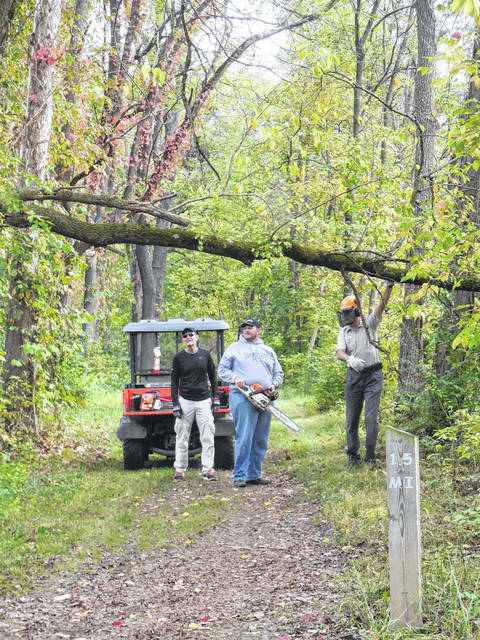 Volunteers from the St. Marys Kiwanis Club, Buckeye Trail Association, Ohio State Parks, Heritage Trails Park District and others completed trail checks and maintenace in October on the Miami & Erie Canal towpath. Pursuant to the Ohio Revised Code, it is the mayor’s responsibility to present an annual report which reviews projects and tasks within the city during the prior year. It is now my privilege to highlight the accomplishments of our city and staff for the year of 2017. 1. Monitoring and managing finances. This continues to be a challenge, especially for the general fund and electric fund. The general fund in 2017 benefited not only from stringent cost-saving measures but also from the addition of funds generated from kWh tax as well. The general fund as of Dec. 31, 2017, had a net gain over 2016 of $494,538.29. Large expenditures from the electric fund were prevalent in 2017 because of the significant upgrades to our grid. 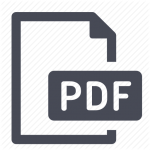 A detailed explanation of the electrical expenditures and upgrades is provided in the electric department section of this report. In 2018, expenditures will not be as significant. The sewer fund has become a concern, and the rates must be reviewed for potential adjustment in 2018. All other funds are performing as required. 2. Continuous improvement programs. In 2017, the City of St. Marys realized the benefits of the Advanced Metering Infrastructure project. City employees are now able to access meters remotely, which can help resolve issues and explain usage, review trends, track power outages and affected areas; and this infrastructure will provide accurate, real time data. Another major improvement was the purchase of a new Leaf Vacuum truck. The new truck replaced two other trucks and requires one operator, allowing the other three to five employees, previously needed, to perform other duties. One truck and one employee can complete the task of two trucks and four to six employees faster, safer, cleaner and better with a total estimated annual savings of $34,772 (1,012 hrs. x $34.36 = $34,772). The Return on Investment will be 4.93 years on a total investment of $171,500. The cost savings for insurance, fuel, vehicle maintenance, and other associated cost savings were not considered in the ROI. Information technology continues to add automated systems that allow city employees to perform their duties faster, more efficiently, and with greater accuracy. 3. Pursue new business and industry. Seven new businesses are or will be calling St. Marys home during 2017 and 2018. Existing businesses and industries continue to grow in St. Marys by adding new lines and jobs to their facilities. 4. Electric department infrastructure improvement. 2017 saw the largest equipment expenditures with the renovation of the Spokeworks Substation; doubling the size and capacity. This improvement, along with other electric infrastructure improvements, is part of a six-year project that started in 2013 and is expected to be completed by 2019. Upon completion of this project, St. Marys will have one of the finest electrical delivery systems in the state of Ohio. With proper maintenance and technology updates, this delivery system will continue to deliver unrivaled reliable electrical power to our customers well into the future. 5. Construction of a new water plant. Construction of the new water plant has not begun as of this report date because additional time is needed for the plant design phase. It is better to clearly define the plan deliverables rather than to start construction without all system requirements being clearly defined. 6. Restoration of the Miami and Erie Canal. Two plans have been completed in 2017 for cleanup and restoration of the canal; Miami and Erie Canal Alternatives Analysis Report by KCI and the Collaborative Development/Tourism Plan by Poggemeyer Design Group. The City of St. Marys has requested $10 million from the State of Ohio to restore the canal and to clean the water. 7. Pressure state and federal officials to clean up Grand Lake St. Marys. We have met with U.S. Rep. Jim Jordan, state Rep. Craig Riedel and state Sen. Rob McColley to discuss GLSM and Miami and Erie Canal issues. 8. Develop the Tow Path Along the Miami and Erie Canal. The Collaborative Development/Tourism Plan by Poggemeyer Design Group was completed in 2017. The $50,000 grant received to develop the tourism plan will enhance our efforts to secure additional funding for canal improvement. The Collaborative Development/Tourism Plan by Poggemeyer Design Group is a joint effort of Fort Loramie, Minster, New Bremen, St. Marys and Spencerville. 9. Restore the Reservoir Mill. Architectural plan and drawings to restore the Reservoir Mill to its historical significant footprint have been submitted to the structural engineer for review and approval. Upon approval of the plan and drawings by the engineer, the engineer will forward all documentation to the Ohio Historical Society for approval. After the Ohio Historical Society approves all documents, restoration work may begin on the mill. 10. Small lot disposition or repurposing. Several lots that are not suitable for building on have been repurposed as green space, and trees have been planted upon them. Two lots have been donated to worthy nonprofit organizations to build new homes for deserving veterans and other citizens. One additional lot was sold to Lots for Soldiers at a greatly reduced price. 11. Interchange beautification and state pollinator grant application. Weed emergent application work began in 2017 at two interchanges: U.S. 33 and state Route 66, and U.S. 33 and state Route 29 and will be reapplied in 2018. Native Ohio pollinator plants will be planted in 2019 and should reach maturity in 2024, allowing the plants to reseed each year. Pheasants Forever is donating the seed and labor. Additionally, the city is working with the Grand Lake Bee Keepers Association to reintroduce native species of bees to the interchanges and other strategic locations within the city. Pollinator plants will be introduced throughout the city for beautification, environment and cost-saving purposes. The City of St. Marys can save mowing, labor, insurance and equipment cost through this program. 12. Walnut Street. I have decided to take no further action regarding Walnut Street until it becomes necessary to do so. If action is needed to repair a utility, it is my intention to repair the utility and to restore Walnut Street to its original brick surface and limestone curbing. Walnut Street is the city’s last remaining brick street, and I will keep as such as long as I am mayor. 1. Monitor and manage finances. 3. Aggressively pursue new business and industry. 4. Continue with the electric department infrastructure improvements. 5. Begin construction of the new water plant. 6. Revitalize the Miami and Erie Canal through the City of St. Marys. 7. Develop the towpath along the Miami and Erie Canal. 8. Continue to pressure state and federal officials for the cleanup of the canal. 9. Continue to pressure state and federal officials for the cleanup of the lake. 10. Restore the Mill as finances permit. 11. Small lot disposition or repurposing. 12. Interchange beautification-state pollinator grant application. 13. Converting old railway bridge into a pedestrian bridge over canal. • Attract new jobs to St. Marys that will strengthen the city’s economic base through a two-part effort. Short term: Support existing industry and commercial businesses located in St. Marys. Existing businesses are the best method to maintain and create new jobs. In addition, vigorously work to attract specialty shops and other businesses into the downtown. A vibrant downtown is essential to a progressive community. Long term: Develop a master plan to make St. Marys and surrounding communities attractive to medium and large employers. The City of St. Marys will be stronger if we work with neighboring communities to promote economic development; there is strength in numbers. • Provide the citizens and businesses of St. Marys with superior services and utilities at the lowest price possible. • Promote and support the restoration of Grand Lake St. Marys through such groups as the Lake Restoration Commission and Lake Improvement Association. Continue to pressure State and Federal Officials to assist with the lake restoration. • Promote the revitalization of the St. Marys River, Miami and Erie Canal, Girty’s Town, and Fort St. Marys. • Preserve and renovate historic structures in downtown St. Marys rather than follow a path of demolition. • Identify potential private and public sources that could help finance the preservation and restoration of downtown St. Marys. The City of St. Marys is committed to its goal of continuous improvement and enhanced customer/citizen satisfaction. https://www.limaohio.com/wp-content/uploads/sites/54/2018/02/FULL-REPORT-2017.pdfSee a PDF of the full report from St. Marys mayor Patrick McGowan.